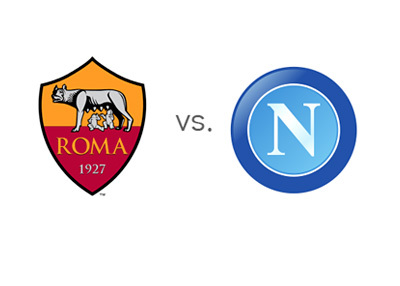 AS Roma host Napoli in the 29th round of Italian Serie-A on Saturday, April 4th, 2015 at the Stadio Olimpico in Rome. Both teams are struggling in form lately, but are still in the fight to qualify for the next season's UEFA Champions League. Daniele de Rossi's first-half goal got Roma a 1-0 victory over Cesena and three valuable points that put them 1 point ahead of third place Lazio and 6 points ahead of Napoli. But beating a relegation candidate like Cesena is not a confidence booster by any means. Prior to this match, they drew with 15th placed Chievo 0-0 and produced the same results (drawn games) from all their previous three encounters. Napoli struggled to remain in the Top Four of the Serie A as they were held to a draw by lowly Atlanta 1-1. The Naples club find themselves in the fifth place with 47 points, one behind 4th placed Sampdoria. While Napoli have managed a berth in the quarter-finals of the Europa League, they would dearly want to score three points on April 4 when they face 2nd placed AS Roma in a vital Serie A clash. Napoli seems to be giving away vital points of late. Early in March they blew away a chance at a comfortable win against Inter-Milan after leading 2-0 and that too at home. With players like Gonzalo Higuan, Marek Hamsik and Jose Callejon upfront Napoli were expected to do better. The talented 23-year old Kalidou Koulibaly is found wanting in a defense that has been breached seriously over the season. The Ciucciarelli have taken in as many as 36 goals in the Serie A in 2014-15. Roma have conceded just 21. But Napoli do have a penchant for scoring and have banged in 47 next only to champions Juventus's tally of 55. Roma can feel relieved that they may somehow cling to their place in the top four by the time the Serie A season ends in May 2014-15 and give the 2015-16 Champions League qualification a shot. Napoli, too, are low on confidence after having begun March with a 0-1 loss to Torino and losing again to 16th placed Verona 0-2, throwing away a winning match to Inter Milan in a 2-2 result before drawing with minions Atlanta. For Napoli the April 4 clash will be a do-or-die affair, where even a draw won't work for them. They can take comfort in the fact that they beat their rivals from Rome on both occasions they met in 2014. Their chances to qualify for the next year's Champions League hang in balance. In a match between two jaded sides, bookmakers are tipping Roma to win at home.